Liberty North High School’s marching band is everything one might hope for. From Reigning Champions at Carrollton Band Day to Best Visuals of the Night, the band has won several awards since it first opened in 2010, proudly representing their school. Each individual of the band works hard, beginning in the summer, to pull off the award-winning performances, but it could not be done without the Drum Majors. “Since my freshman year, I’ve always had a dream to be a Drum Major and conduct the band and finally, as a junior, I got the opportunity to. After conducting the band, my passion for music grew drastically and I practiced music a lot more and tried out and made the All-District band and even made the All-State band and got to be a part of those ensembles, which was a really great experience. 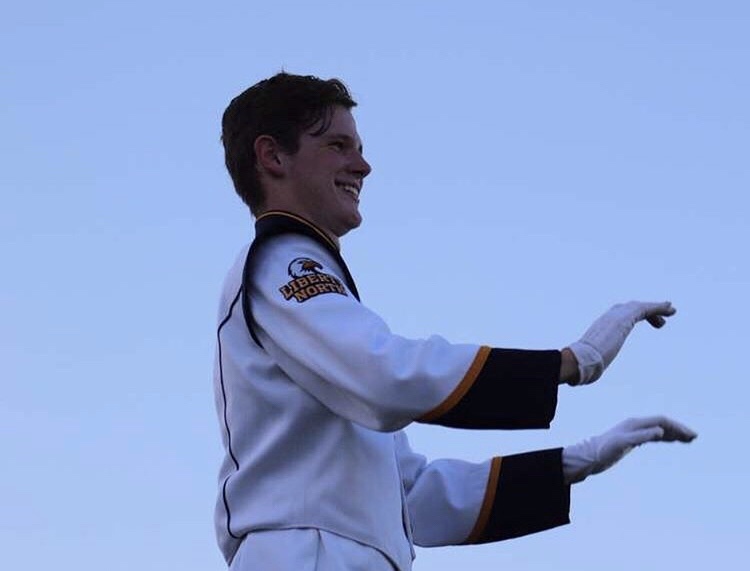 Making the All-State band took hours and hours of practice, before school, after school, and even during school, plus every weekend for at least a month straight, but it was definitely worth it,” junior Jackson Krop said. Even after marching band season is over, which typically ends in late October, the band works hard and learns new music, putting on concerts for the Eagle families and, this past year, even performing at an invitation-only event, like MMEA. “When I went to the Missouri Music Educators Association at the Tan-Tar-A Resort this year for All-State band I was playing with people from all over the state, including some of the best musicians in Missouri. Talent wise, this year was a little more advanced experience, but emotion wise, last year, when I went to MMEA with Liberty North, we had waited and prepared music for four months before we got to perform it and listening to the final product at MMEA was so rewarding. There wasn’t a dry eye in the whole audience. It was an experience I won’t ever forget,” Krop said. 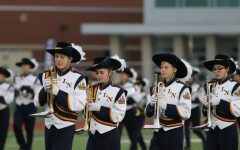 Based on the recognition members of the Liberty North band have received from judges and contests, they are some of the most talented musicians in the district. The band, whether it is marching season or concert season, never fails to represent Liberty North well. “So, this year, I tried out for All-State band on two saxophones, but next year I plan to try out on three, which, hopefully, I make all three. I plan to take that experience into Jazz Band and out for the All-State Jazz. I hope to be head Drum Major next year and I don’t know who the other two will be, but I know that we’re going to have a really good show especially with a really talented freshman class coming in. It should be a lot of fun next year and I can’t wait,” Krop said. High school does not last forever, but the experiences tend to, inspiring college-bound students to continue their passions alongside their majors. “I don’t plan to major in music, but I do hope to get a minor in some sort of music performance or composition. I’m more focused on the math field. Even though I’m so focused on the math side of things, I think it would be really cool to be in a college jazz band or college marching band for a year to gain that experience, especially after I’ve had such a good time and made so many connections because of band in high school,” Krop said.